“Look, a student gave me a dippy bird!” exclaims painter Michael Gallagher as he greets me at his solo show Hallucination Engine at Schmidt Dean gallery recently. His enthusiasm for this little glass figurine that bobs as it drinks from a glass of water underlines the sense of humor and playfulness that he brings to his paintings. One of the most successful works in the show titled, Heat Engine (Dippy) echoes the color and shape of that toy bird, a toy Gallagher admired deeply as a child but never owned. As Gallagher explains in the exhibition catalog , titles are derived by naming something that “lends a degree of specificity without completely shunting [the painting] into a narrow read.” This teetering place at the edge of recognition is the show’s source of power. At first glance, the scale and prominence of vibrant colors in Hallucination Engine may lead a viewer to falsely believe they are strictly formalist works about shape and construction. Born less of that Hans Hofmann New York School, this work owes more to Arthur Carles, Stuart Davis, Charles Sheeler – the Philadelphia brand of modernism. It operates with a shared belief in instinctive decision-making and solid compositional design, a departure from a most austere approach towards imagery and play. 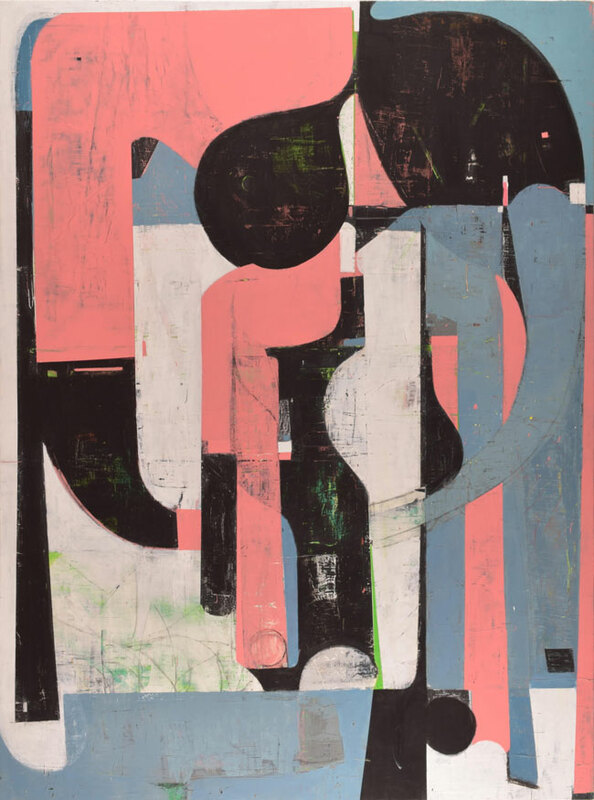 A sustained engagement with any canvas in Hallucination Engine yields movement, and the enervating discovery of initially unseen elements, such as in Big Pink, where a tiny square becomes an elephant’s eye on a trunk-shaped profile. The paintings unfold and nod back at you when given time and consideration. Michael and I sat down in the gallery to look carefully and discuss questions of process, intention and the best paint colors. AL: In the exhibition catalogue, your artist statement feels very automatic and free, like a record of your mind making jumps and connections. Does this relate to how you allow the work to come together, through freedom and trial, or are you pushing against something? AL: Do you have a certain intention for the work, as in where it should sit between abstraction and representation or what happens with regard to space, color? MG: I do enjoy images that move between differing degrees of abstraction and representation. These two terms, although useful, are also problematic, due to their degree of relativity and differing usages – I mean, I use them, but they always need clarification. Of course, space and color are a central concern, inseparable from one another, and I do spend a lot of time considering how forms sit in space and relate to one another. I’m told that an abiding interest in these matters, often referred to as ‘formal’ or ‘modernist’ are no longer sufficient unto themselves, but I don’t quite see it that way. 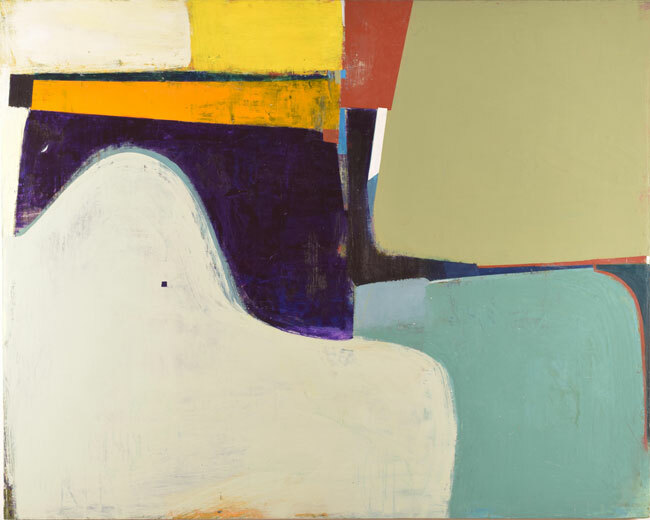 A really good Amy Sillman painting, which connects to a Diebenkorn, that hinges on a Matisse, which converses with a Cezanne, that drinks from a Delacroix, that dreams of Rubens, that sings to Titian, who honors Bellini, who gets so much from the Byzantine tradition of painted icons and, well, let’s just cut to Giotto (and that’s only the Western route). 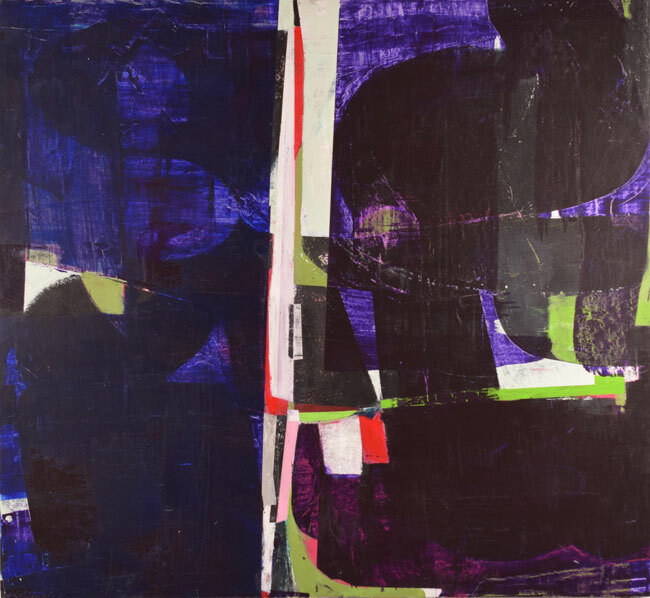 All of these reference points insist on a type of visual language that privileges structure and complexity through space, color and composition. AL: What is the significance of the magnolia for this series which is the title of a few of the paintings? MG: I have painted this motif for at least a decade at this point. It began with the more naturalistic paintings – a series of table top still-life’s that concentrated on ‘white’ as the subject of the work, white crockery and the like, which led to the ‘white’ of the magnolia, perhaps influenced by John Peto’s series of magnolia paintings and certain works by Martin Johnson Heade. buds just beginning to open to full blown blossoms. They are a real challenge because they bloom so quickly – you have to work fast. They are very sensual forms – the most interesting still-life images have that sensual element – and they have recently been imposing themselves on the more abstract works. AL: Is color derived more from a perceptual decision or an emotional one? my studio recently, I got more than a few quizzical looks. AL: What are your favorite paints on your palette at the moment? MG: Magenta/various types of blue/greens (Azurite/ Turquoise Green/Yellow Green), Quinacridone Violet, (various grays) – what might be described as high-keyed, saturated ‘contemporary‘ colors. Not unlike the colors in Bonnard paintings painted a hundred years ago. Hah! So much for the contemporary. AL: What work have you been looking at recently? MG: I recently visited the Degas exhibition at the Modern, Bill Scott’s solo show in New York, along with the Bonnard retrospective in San Francisco. All great examples of the type of work that allows for sustained viewing: the more you look, the more you get, but you gotta pony up. Of course, I’m constantly looking at books and images online – always. AL: What couple words or phrases do you hope it boils down to? What do you hope a viewer of your work leaves the show thinking about? MG: Surprise – the pleasure of looking, and a sense of discovery. Painting can do so much. Paintings, along with other forms of visual art, all art-forms, recalibrate the way we see and think the world. The multiple reads an image can offer are, for me at least, enjoyable and a constant reminder that it pays to pay attention. In the words of Dave Hickey, ‘Art is the antidote to everything else’ – how can you top that? Hallucination Engine is at Schmidt Dean through May 28th.